Being a practitioner of Anusara yoga for many years, I've learned to be more accepting -- particularly in my practice. Each day is different, and the body's responses and abilities are no different. Whether a good or bad day, I try not to attach my ego to either one. It's not easy, granted, but I think I'm on the right track. 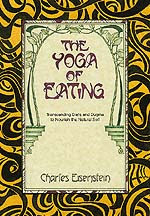 Yogic expressions can be found in all walks of life; food and eating being no exception. Mr. Eisenstein's book sounds interesting. I'll definitely look it up! This is a great post for a interesting book. I agree with everything! I have learned over the years to listen to my body so I started avoiding certain foods and food combinations I was having troubles with (most meats, certain vegetables and fruits). I listen to my cravings as well because if I ignore them they just come back stronger. And I don't fight my body anymore in the sense of trying to reach a certain weight (the result being I have no problem maintaining my ideal weight). Your body is your best friend. Just love it and listen to it!